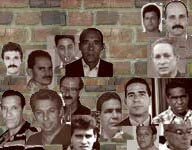 The front lines of the struggle for Cuban freedom have long stretched to behind the bars of the Castro gulag, with political prisoners and others for more than 50 years resisting the regime's attempts to break their will and their spirit. One such prisoner is Yosber Román Ramón, who currently is on hunger strike because of his refusal to wear a uniform, which would designate him as a "common" prisoner, and not a political prisoner. In retaliation, his guards are blocking him from receiving needed medical care, according to a report from independent journalist Dania Virgen Garcia posted on Miscelaneas de Cuba. It is a common routine, with the Castro regime doing its worst to impose the maximum possible punishment -- death -- on those prisoners who refuse to sacrficice their principles and their commitment to a free Cuba. Roman's struggle may appear futile but like in other similar instances, his story represents to what extent so many Cubans are willing to go to resist the Castro dictatorship. Even in jail. There was no information available online on why Roman is in prison. But his actions as a prisoner, and his motivations, may him deserving of having his story told.